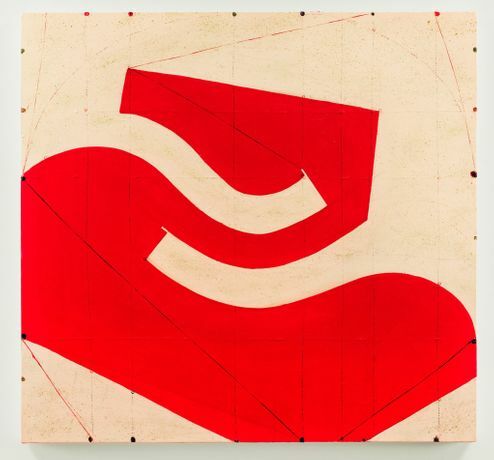 Paul Kasmin Gallery is pleased to announce New Paintings, an exhibition of recent paintings and works on paper by Caio Fonseca at 297 Tenth Avenue from March 25 – April 25, 2015. This is the artist’s sixth solo show with the gallery. Caio Fonseca, who has previously achieved his compositional energy through the interaction of multiple forms, has now moved in a more simplified direction. The central shapes in these new canvases are conceived and constructed in such a way as to achieve a lively interaction between a positive form and negative space. The invention of this principle construct is, to a degree, informed by the artist’s recent study of classical music composition—an underlying influence throughout his oeuvre. Despite their seemingly graphic simplicity, every inch of the surface is enlivened with minute details, the tether and pull of fine lines that add a degree of animation to the monochrome picture plane. Caio Fonseca (American, b. 1959, New York) studied painting in Barcelona and worked throughout Europe until 1991. His work was presented in retrospective at the Corcoran Gallery of Art in Washington D.C. in 2004 and at the Institut Valencià d’Art Modern (IVAM), Valencia, Spain in 2003. Fonseca’s paintings are in public and private collections throughout Europe and the United States, including the Smithsonian Institution in Washington D.C., and New York’s Whitney Museum of American Art, Metropolitan Museum of Art, and Museum of Modern Art. He divides his time between Pietransanta and New York City. For press requests, please contact press@paulkasmingallery.com.